Ricky Nelson died in a plane crash on New Year’s Eve, 1985, but his music has lived on through his twin sons, Matthew and Gunnar Nelson. If Elvis Presley was the first name in the first generation of rock heroes, the argument can be made (with apologies to Chuck Berry) that Ricky Nelson was the second name. Thanks to weekly appearances on his family’s long-running sitcom, “The Adventures of Ozzie & Harriet,” Ricky Nelson had weekly national exposure for such hits as “Hello Mary Lou,” “Poor Little Fool,” “I’m Walkin’,” “Travelling Man” and “It’s Late.” That coupled with his almost supernatural physical attractiveness made him a superstar. But because of this teen-idol aspect of his career, Rick Nelson—as he called himself in later years-- was often dismissed as a lightweight of little consequence. But he was a true musical pioneer, both as one of the artists most responsible for the popularity of rockabilly during the late 1950s, and a decade or so later as a central, if unheralded, figure in the development of country-rock. 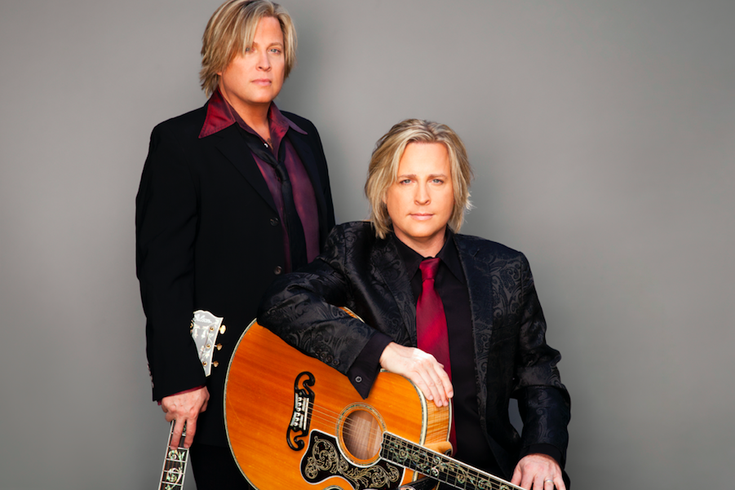 Rick Nelson died in a plane crash on New Year’s Eve, 1985, but his music has lived on via his twin sons, Matthew and Gunnar Nelson (of the ‘90s rock band Nelson) who for years have toured a multi-media presentation called “Ricky Nelson Remembered.” They bring the show to Borgata Hotel Casino & Spa Friday night. 1. Their paternal grandparents are show biz royalty. Ozzie and Harriet Nelson became stars in the 1930s. Ozzie was a top bandleader while Harriet (nee Hilliard), was a successful singer and actress (she co-starred with Fred Astaire and Ginger Rogers in the 1936 musical, “Follow the Fleet”). And before their TV sitcom, “The Adventures of Ozzie & Harriet” debuted in 1952, the family had a hit radio series of the same name that premiered in 1944. 2. Fame is also no stranger to their mother’s side of the family. Kris (nee Harmon), is the daughter of football legend Tom Harmon and sister of actor Mark Harmon (their sister Tracy is also an actress, having co-starred in, among other series, “Square Pegs” and “Father Dowling Mysteries”). 3. The twins were a top pop act of the early-1990s. Thanks to their bloodlines, stunning Nordic looks, and knack for writing hook-laden pop tunes, Nelson was a no-brainer for an age when the “M” in “MTV” actually stood for “music.” Their two biggest hits were “(Can’t Live Without Your) Love And Affection,” which reached number one on Billboard magazine’s “Hot 100” chart in September 1990, and “After the Rain” (#6; February 1991). Their debut album, also called “After the Rain,” sold more than 3 million copies. 4. Their show is a full-blown tribute, not just a few Ricky Nelson songs thrown in between original numbers. “It’s a high-energy-rock-’n’-roll-show-meets A&E’s ‘Biography’ with large-screen video with [such stars as] Chris Isaak, Paul McCartney and John Fogerty talking about him,” explained Matthew during a recent interview. “It goes through his story. When Gunnar and I go on stage and perform our show, it’s bigger than we are. We are representing our entire family up there. We take it very seriously. This is the soundtrack to our lives. This is our dad. This is our family. 5. You can get up-close and personal with Matthew and Gunnar at Borgata. “Gunnar and I meet everybody who wants to meet us at the end of our shows, which we couldn’t do when Nelson was completely crazy in 1990 because people would rip our clothes off,” he said. Borgata, 1 Borgata Way, Atlantic City, 9 p.m. July 14; $35 and $29.50, 866-900-4849; or click here for more information.